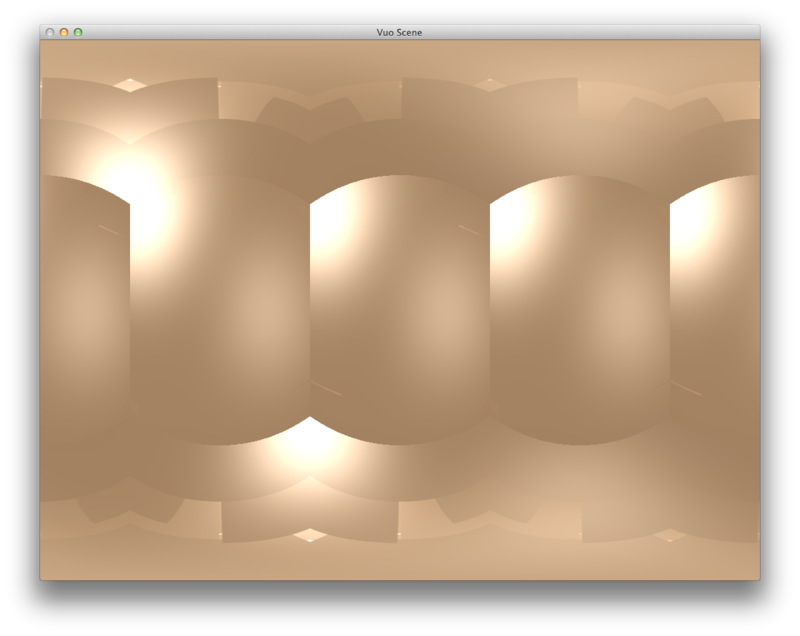 Currently when you generate a mesh with make.parametric.mesh the generated planes are camera aligned. This is great for 1 camera view, and if the camera views are not fused together. 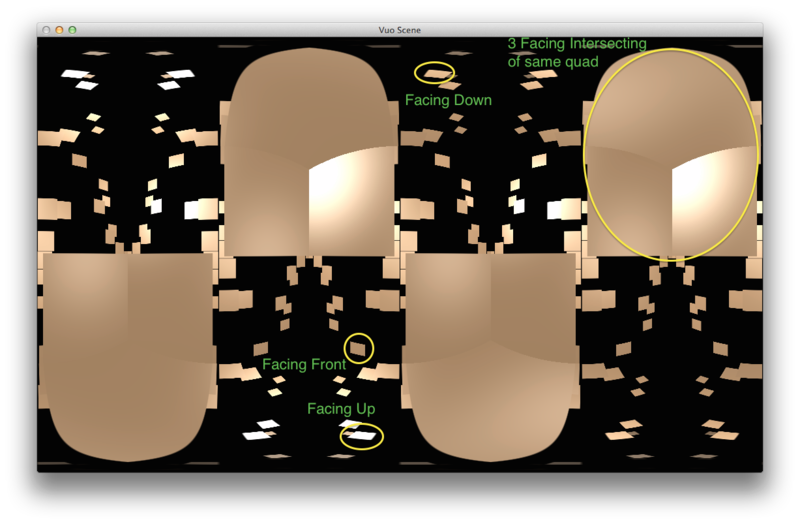 However when the camera views are joined (as in generating a cubemap in of a screen: 6 camera views) then the joined cameras contain planes of different facings. A solution could be to allow a custom facing value as well as default facing. That way we can point the facing towards the centre camera. The facings would need to all point towards this "centre" point. Such a solution would also need to be incorporated into any future particle system node (if it uses quads to display each particle). A few quads, orientation of quads can clearly be seen as different in each camera. Lots of quads filling space, notice clearly visible cameras due to quad orientation. Composition attached + custom node. (please note custom node still in development and currently I haven't had time to fix the rotation input to degrees (or anything logical) but still works. A solution is to use custom objects and simply use copy and parametric points to distribute the copies in space. However that does not solve issue with quads facing a single camera point (such as it is in 360VR). UPDATE: Make Random Points Object exhibits same behaviour. Currently, the generated points are converted to quads that are parallel to the plane of the camera (projection frustum's near/far planes). point the facing towards the centre camera. The facings would need to all point towards this "centre" point. The custom point would always be the same as the camera point, right? So let's simplify and say that we want to add an option to make the quads oriented to face the camera (perpendicular to a line from the center of the quad to the camera point). This could be implemented by adding an input port to Make Point Mesh to choose between Parallel To Camera and Facing Camera. I've updated the title of this feature request accordingly and opened it for voting. Yes yes yes yes yes! Thank you for posting this Jaymie!! Not quite sure how to add this but it's related. For this question, I might alter the FR title to be, "Option for points, line strips, (and for any upcoming strips like triangle strips and quad strips) to face the camera". I got here because I tried combining a Make Point Mesh with a Make Line strip Mesh to fill in the gaps created by the line strip. I wish to be able to combine mesh strips and have some consistent behavior. With Vuo's nice line strip 3D ribbon behavior, it appears that the line strip is made of quads as well? And... I stray off topic: is there a more elegant solution for filling in the gaps on Make Line Strip Mesh and keeping the 3D ribbon look? Maybe this is part of a Make Triangle Strip Mesh (and Quad) FR? jersmi yes I noticed that Make Line Strip exhibits same behaviour. Jaymie would this request also be able to encompass this current FR? Or should it be separate? Also jersmi when you say gaps are you talking about between line segments how it looks like they are cut off? I think that is a line tangent request I made. That would be covered by Render smooth joints when using the "Make Line (Strip) Mesh" nodes, right?